NOTE: This item comes in a GREY Color, not available in Black. Note: Can only use up to 8x9" designs on Brother PR machines, unless you are splitting designs on your embroidery software or Brother's PE Design software first. Double height, 24cm x 24cm (9″×9″) square frame. Fits Brother PR600/Baby Lock Series machines. Common uses: Children’s clothing, larger square designs that round hoops cannot accommodate. This hoop fits the Brother PR600, PR-600C, PR600II, PR620, PR650, PR1000, and the PR1000e and the Baby Lock EMP6, BMP8, BMP9 and ENT10 embroidery machines. The hoop carries a LIFETIME WARRANTY on the plastic components and feature Durkee’s exclusive EZ TURN Thumbscrew. Ships with the brackets attached. Grids not available. *To embroider a design of 5 x 7" you must allow for the design itself, as well as, the sewing head. The next size up for that from Durkee would be our 9” x 9” hoop. As long as that size hoop will fit into the project you are embroidering, that would be your best bet from Durkee. It also happens to be the most popular hoop size we sell to the home embroidery market. It is our pleasure to detail the guarantee provided for our tubular hoop line. We guarantee the plastic component of the round hoops for a lifetime against manufacturer's defects. We will exchange the plastic component at no cost provided the breakage is not due to abuse or using the parts in a manner not consistent with commercial embroidery practices. 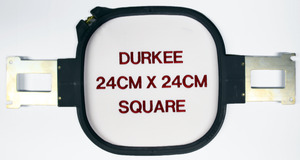 The Durkee Embroidery Hoop - 24cm x 24cm (9"x9") Square is great for embroidering children’s clothing and larger square designs that round hoops cannot accommodate.This Durkee Embroidery Hoop - 24cm x 24cm (9"x9") Square is constructed of high impact plastic making it virtually indestructible. The Durkee Embroidery Hoop - 24cm x 24cm (9"x9") Square has brass inserts for all screws, light texture on the hooping surface, directional guides, and extra height, which aids in holding thicker, harder to hold garments. The adjusting rings' thumb screws on the Durkee Embroidery Hoop - 24cm x 24cm (9"x9") Square are large and long to provide more torque and have a wider space for adjustments. The metal clips on the Durkee Embroidery Hoop - 24cm x 24cm (9"x9") Square are extra long, aiding in vibration reduction. The Durkee Embroidery Hoop - 24cm x 24cm (9"x9") Square metal clips are zinc plated to provide reduced wear, and they come complete with plastic screws and lock washers. Thumb screw is larger and longer than our competitors'. Wide space thumb screw adjusting. For optimum design registration, it is important to use a hoop that is closest to the size of the design. This will help eliminate puckering as well as wasting other supplies, such as backing or topping. Very efficient and the website worked out great for me! The hoop is wonderful. It allows for a larger size design than a 5x7 on a kid shirt. the only problem is that the threads strip after a while leaving the hoop unusable. I love the hoop though so I am about to order my 4th one. Will order again from your site! The price was right. Thanks. I'll be shopping here again. Love you guys... just you have so many items that sometimes it is hard to find what I am looking for. I purchased this hoop in 2011 and recently wanted to use it for an 8" x 8". The hoop is not large enough as the corners are too rounded and the hoop will not accommodate a square design. The wrong Durkee hoop was sent but Delores was wonderful and took care of the problem to my complete satisfaction. Thanks! Will definitely order from All Brands again! I will order from Allbrands before any other internet business when possible because of the friendly, prompt response to all orders and the best prices on nearly all items. Very rarely do I find an item priced cheaper, but I still order from Allbrands because of the very prompt filling of orders. Shipment was fast, price was good. Love the hoop.